In this diagram from A to C is 4 bars long. B is bar 3 – the midpoint. 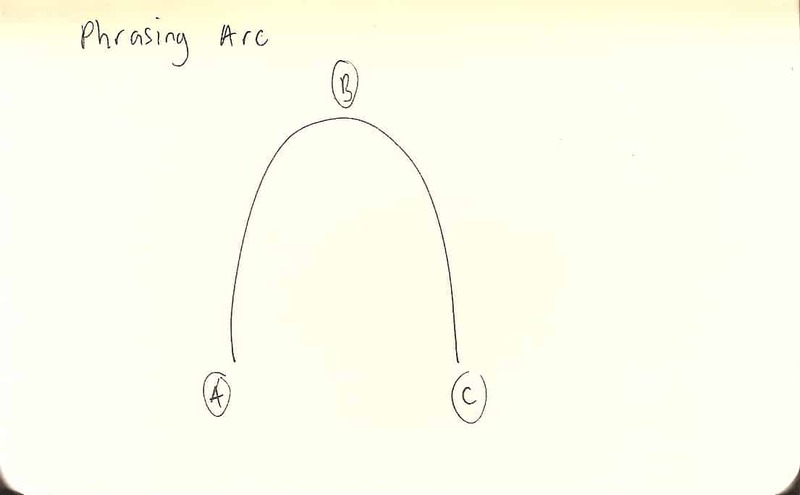 I feel it as an arc because an arc has tension in it. A line doesn’t. Think of it like a roller coaster. Once you’re at the top you can feel the tension and pull of ‘C’ which is the resolution (and start point of the next four bars). When you improvise on a structure like this you can choose to aim at the resolution points or play around with them. For example, you could set up a resolution at C but delay the resolution into the next bar, or abandon the resolution, or just do something other than what’s expected.